When I heard the news this morning that Paul Newman had died, I, like everyone else, immediately recalled memorable scenes from Butch Cassidy and the Sundance Kid, Cool Hand Luke, The Sting, and many other films he made during his Hollywood career. He had a steady gaze, a solid resonating voice, and a confident way of delivering a line — dramatic or comedic — that only truly great actors can manage. Some words are overused in this celebrity-obsessed culture. “Great”, however, is appropriate for someone like Newman. Off-screen, Newman had genuine class and charisma, too. He was married to Joanne Woodward for 50 years, drove race-cars professionally, and created the wonderful Hole-in-the-Wall-Gang* camps for children with cancer and other life-threatening diseases. It’s this latter aspect of Newman’s life (and his book) that I’d like to chat about for a few paragraphs today. About twenty-five years ago, “Newman’s Own” salad dressings started to pop up in grocery stores. It wasn’t just another commercial product with a celebrity label. It was a fund-raising machine for dreams. For many years Newman had made his own salad dressing at home for family and friends. He even bottled it once for guests to take home from a holiday party. It was so good that his friends pleaded with him to go into business selling it. He turned them down again and again. Then the idea of charity entered the equation and he became a man on a mission. 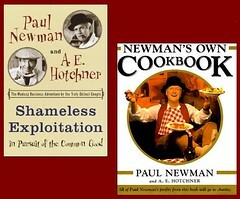 Shameless Exploitation in Pursuit of the Common Good [LibraryThing / WorldCat] is Newman’s own account of his venture into the world of business and, more specifically, the strange world of business for no profit. He and his co-author, A. E. Hotchner, tell the often humorous stories relating to his insistence on no food preservatives, his search for the right bottle, the story behind the goofy product labels, and his iron-clad rule of wiping the financial ledgers clean every year with no money left over. He paid the bills, pocketed nothing for himself, and left everything to charities. Everything. Over $200 million dollars. Each year the company started over with a zero balance. Once the business was established, he began creating a series of Hole-in-the-Wall-Gang camps for severely sick kids. These were children whose worlds had been taken over by clinical tests and long hospital stays. They needed fun and sunshine, too. The camps gave them a chance to be outdoors with other kids like themselves. Doctors were nearby, of course, but the hospital walls were gone. In that environment, they were no longer different. They were not “the kid with cancer”. They were kids, pure and simple. They were invited to have the kind of fun most kids take for granted. And they were free to have the time of their lives. The “Newman’s Own” line of products now goes far beyond his original home-made salad dressing. The Hole-in-the-Wall-Gang continues to thrive, too. Sure, I think of Paul Newman’s classic movies when I hear his name. But even more often — when I’m cooking or having a salad; every time I open a bottle of Italian dressing or a jar of spaghetti sauce — I glance at his silly label, think back a few years when I first read Shameless Exploitation, and smile for all those kids Paul Newman gave (and continues to give) happy childhood memories. That’s his legacy, too. * The Hole-in-the-Wall-Gang is, of course, the name of Butch Cassidy’s band of outlaws depicted in Newman’s most memorable film.